This week I was working on the design of a mentoring workshop for international school leaders. Participants in the training will be spending the next two years mentoring new school leaders enrolled in a leadership development program. 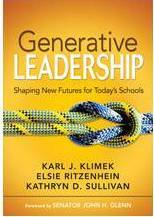 The new leaders will be using the text, Generative Leadership: Shaping New Futures for Today’s Schools. The authors define generative leadership as leading that recognizes and taps the collective intelligence and energy within the organization to generate productive growth and effective solutions. Often the mentors in the program will act as peer coaches: generating reflection and goal setting where the mentees will drive their own learning. At other times the mentors will be in a mentor role providing ideas and suggestions from their personal experiences. The program will also ask the mentors at several spots to supervise/evaluate the mentees’ work. As I read the text to align my workshop I found a metaphor for generative leadership that I thought provided a great description for the role these mentors will play. Co- create….A great description for coach/coachee and mentor/mentee relationships. I will be presenting that thought in future trainings, especially for instructional coaches who play changing roles on the supervision to peer coaching end of the continuum. I love the idea of explaining to teachers that the coach’s work will come from “reading the moves” of the coachee. Shared beliefs and values and a focus on student learning will guide the process. A great metaphor! I use the arts in my representation of leadership and coaching- based in the Medici Effect – the intersection of seemingly unrelated disciplines can result in powerful understandings. Consider the intersection of music and leaders, the poetry of place and organizational culture as two examples. The book you referenced is one that I will read. You may find connections between this book and collective leadership. I believe the concept of collective leadershiop is more powerful than what is termed distributive or shared leadership. The concept is referenced on line by some of the research from the Center for Creative Leadership as well as in some of my publications. Thanks Muchael. I’do some exploration of. Collective leadership.